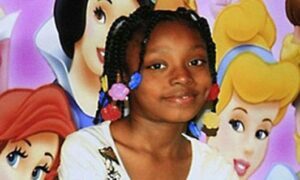 More questions than answers in Aiyana killing: one year on..
It’s been a year since 7-year-old Aiyana Stanley Jones was killed by members of a Detroit Special Response team. The case garnered national headlines for all of the obvious reasons: an innocent child caught in police crosshairs, another black life taken in a city filled with heartache. But little Aiyana’s death was unique because it seemed to embody all that had gone so hopelessly wrong in our entertainment-driven society. The Special Response team that night had been followed by a camera crew shooting an episode of the A&E reality drama “First 48.” David Simon couldn’t have scripted it better. It’s still unclear whether the raid or Aiyana’s subsequent shooting was caught on tape. A&E has since stopped filming the series in Detroit, due largely to legal maneuvers by Mayor David Bing to ban commercial cameras from filming police work. A civil suit filed by the family’s attorney Geoffrey Feiger says the filming influenced police officers to act more aggressively than normal, therefore making the network partially liable for the child’s death. “Detroit 187,” a fictional TV drama, made its much-heralded debut months after the shooting, but was recently canceled. What’s left beyond the view of the cameras is a host of mostly unanswered questions: How does a community respond? How does a family heal? How is a notoriously embattled police department held accountable?